When my husband told me in January that his New Year’s resolution was to climb a mountain I was supportive. One mountain soon tired into three. Little did I know that he planned on dragging me along with him!! So there we were, about to hike over 25 miles of rough and rocky terrain, whilst battling against unpredictable weather conditions throughout and ascending a total of roughly 3500m. Can't be that hard, can it? Before I knew it, July had come and it was time to travel to Letchworth and meet the rest of our group (thankfully everyone was really nice). We had a couple of drinks and some food, everyone was feeling positive! The 10 hour drive to Scotland was gruelling, but we tried to get as much sleep as possible to prepare us for the day ahead. Oh Ben Nevis, what can I say about you. Honestly, the climb was horrible. We faced one of the worst rain storms I've ever seen, constant heavy rain (that was practically horizontal), strong winds and scarce visibility; especially toward the top. About 3/4 of the way I got a pain in my hip and I thought that I wasn't going to finish it. I sat down, caught my breath and took some ibuprofen and my husband told me that we could stop. It was very tempting. But I couldn't, I told myself I could do it. And I did. At the bottom of the mountain we got ourselves some much deserved burgers and slept. Last one, we were feeling pretty positive starting Snowdon, two thirds through, one more to go! The weather had cleared and the views were spectacular! I would recommend climbing Snowdon just for them. The ascent was the quickest we had done, but in parts the steepest, at times it was difficult to pull yourself up! We were all shattered and in need of a breather "Just another 10 minutes and we'll take a break" - you said that 15 minutes ago! By the time I'd reached the top of the climb, with a 5 minute climb to the summit I felt like I was dying, one of our leaders told me to look back and appreciate what I had just climbed. It filled me with elation and spurred me along to finish the challenge! 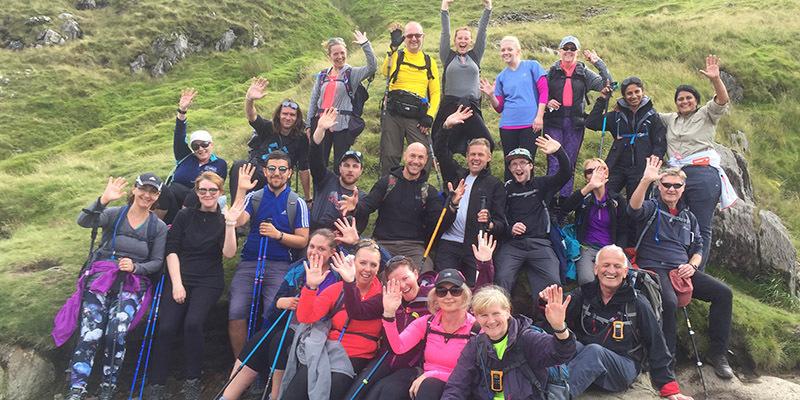 My advice to novice mountain climbers doing the 3 peaks challenge would be to do the 36 hour stint as we did – it's easier, more fun and a whole of a lot let stressful! Plus you can take time to appreciate the scenery, which is gorgeous! Train as much as possible even if it's continuous walking, but make sure to brave all weather conditions. Keep drinking! One of the most important things is to keep yourself hydrated on both the assent and the decent of each mountain. Work as a team, there is nothing worse than being at the back feeling like your slowing everyone down. Encourage your group to keep their spirits up so they can complete their challenge. I'm extremely thankful to everyone at Challenge Central, without them I never would have been able to complete this challenge; I will never forget their support and guidance.